Our vehicles are getting bigger, but they use less fuel than just a few years ago. How is this possible? Because of fuel economy regulations manufacturers are making cars lighter, engines more efficient. Technological progress in the automobile has come with certain tradeoffs, one being an increase in size. Perhaps cars have inflated in size to better fit their occupants. Anyone who’s ridden three across in the back seat of a 1990s compact knows what we’re talking about. Safety standards and packaging even more airbags into each car have also contributed to the growth of the modern automobile. The even larger 2017 Honda Accord has a higher EPA rating than our 10 year-old Civic. The “small” 2017 Honda Fit has more interior volume that our Civic — also more than a 1992 Accord! 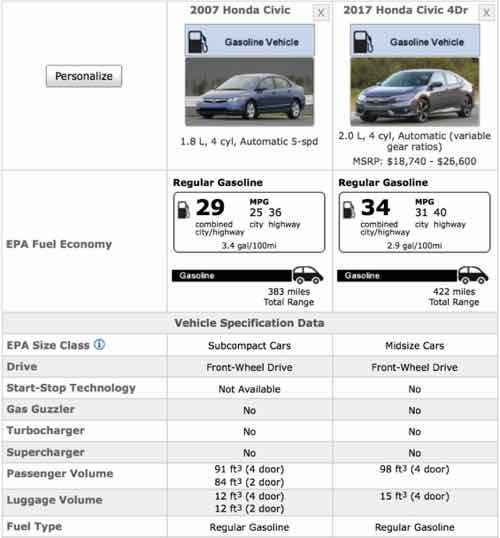 Better fuel economy too — 22 combined for the ’92 Accord but 36 for the new Fit. Worldwide regulations have pushed manufacturers to make cars better. Originally, regulators mandated that automakers achieve an average 54.5 mpg by 2025, but they relaxed that target to between 50.8 mpg and 52.6 mpg last year. Now, automakers will have more time to fight the standards, as the review process could take about a year. The Trump administration would virtually eliminate federal funding for the Environmental Protection Agency’s budget for vehicle emissions and fuel economy testing but will seek to raise fees on industry to pay for some testing, a government document shows. California will move forward with vehicle pollution targets set forth by the Obama administration, despite a move by current President Donald Trump to put those targets on hold. Don’t be surprised if the Trump administration tries to take away California’s right to set their own auto emissions standards. Sunday Poll: Should Stricter Emissions & Fuel Economy Regulations Be Eased? April 30, 2017 Environment, Featured, Sunday Poll, Transportation Comments Off on Sunday Poll: Should Stricter Emissions & Fuel Economy Regulations Be Eased? In a March 21 budget document posted online by the Washington Post, the Trump administration proposed eliminating $48 million in federal funding for EPA vehicle and fuel testing and certification. Some argue the regulatory goals are attainable while others say they’re hurting manufacturing jobs. Today’s unscientific poll seeks to find out reader views on the issue. 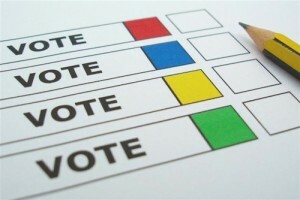 The poll will close at 8pm. A majority of those who voted in the recent non-scientific Sunday Poll think Missouri shouldn’t close interstate rest areas as a way to close budget shortfalls. I know I like rest areas when I’ve driving — a restroom without having to buy something. Those few minutes out of the car improves my alertness. I am curious about the cost of a rest area vs a welcome center. 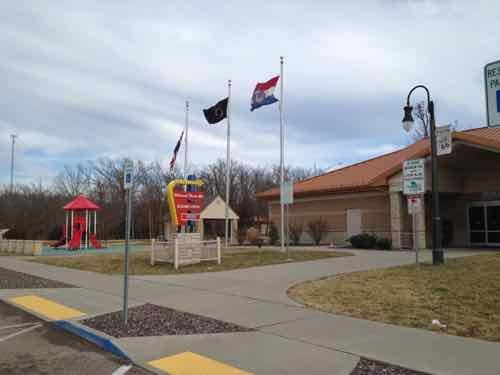 Sunday Poll: Should Missouri Close Interstate Rest Areas? April 23, 2017 Featured, Missouri, Politics/Policy, Sunday Poll, Transportation Comments Off on Sunday Poll: Should Missouri Close Interstate Rest Areas? How many rest areas does Missouri have? Many, including regional elected officials, letters to the editor, and others, are pushing the idea of turnstiles as a way to increase public safety on our MetroLink light rail system. Incredibly ill-informed because turnstiles, physical & virtual, are meant to combat fare-evasion. Heavy rail systems like Chicago’s EL, the NYC subway, and DC’s Metro, have long had turnstiles to address fare evasion.They still have crime issues on trains & platforms. Turnstiles do not prevent crime. By nixing fare gates, public transit agencies emphasize ease of access over making every last rider pay. Europe got into “proof of payment” systems—where wandering personnel request evidence you paid your way—in the 1960s. They made it to American shores, mostly in light rail systems, by the 1990s. Now, 21st century tech is making it easier than ever to blow up the turnstile. Modernized, cash-free fare payment methods—like reloadable tap-and-go cards, or apps that let riders use smartphones to get tickets, Apple Pay-style—speed up boarding. Passengers don’t have to struggle past fare gates. They can board through any door, instead of pushing through a bus’s front entrance to pay the driver. Here Metro St. Louis has been updating stations with a high tech fare gate that will hopefully be ready soon. The source above lists a number of cities and the cost to add turnstiles. In 2009 they estimated it would take St. Louis & Portland OR 45 years to break even on turnstiles, Charlotte NC was the only one higher at 50 years. The 2009 cost was $1.25 million per station — roughly $1.4 million per station in current dollars. With 37 stations in the system that’s $52 million! Entering & exiting the system would be more cumbersome for everyone — some paying riders would very likely stop riding. Many of the 4% that currently evade fares would struggle to get to work. The leading crime on the CTA, theft, was down 38 percent, from 514 thefts reported in the first four months of 2014 to 320 thefts during the same period this year. The decline comes on the heels of a 26 percent drop during all of 2014 compared with 2013, the Police Department reported. Last year saw the fewest serious crimes in the previous four years, according to police statistics. Robberies, the second most common crime on CTA property, declined 20 percent through April of this year, to 92 reported incidents from 115 for the same time a year ago, police data show. 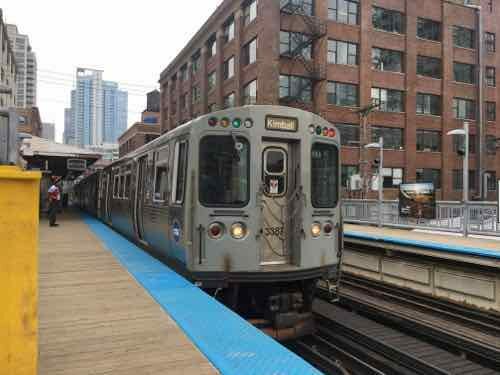 Some CTA riders are concerned after a recent spike in crime. Police issued a community alert warning of two men robbing people at gunpoint on CTA trains and at CTA stations. Surveillance photos of the suspects were released overnight. Police are also investigating a stabbing. A disgruntled straphanger waved a gun at an MTA worker because he was upset over service disruptions, cops said. Turnstiles do not prevent crime. When we roll out smart card technology next year, the lights on ticket validating machines will let you know if your Gateway Card has enough money stored on it to take Metro. In the future, if your smart card is not valid for travel, the light will flash red. The lights are being turned on for testing on the MetroLink system. Turnstiles physical & otherwise do not prevent crime. Their goal is to increase fare recovery without reducing ridership in the process. That’s it. Q: Agree or disagree: Adding turnstiles at MetroLink light rail stations will greatly improve public safety. Please don’t be fooled by the turnstile magic bullet.